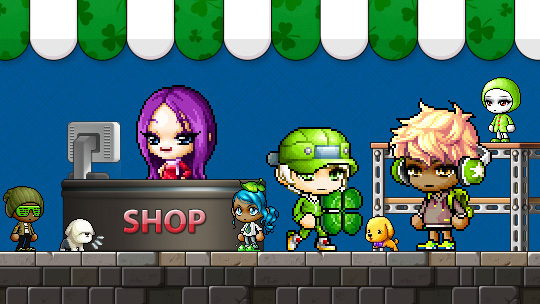 In order to celebrate the Saint Patrick's Day, MapleStory added St. Patrick's Day Surprise Style Box to the Cash Shop this week. This event starts from March 15 and ends on March 21. The St. Patrick's Day Surprise Style Box features a random permanent St. Patrick's Day theme equip and there are 50 different permanent items available. In non-Reboot worlds, you can trade these style box items with other players through the Cash Item Trade window, if you haven’t equipped them. Right-click on a character to see the menu. Plus, players can exchange the special box with NPC Ari, located near the Free Market entrance, and receive an Avatar Box Stamp. You can receive one stamp per item. This stamp is permanent and untradeable. When you collect enough stamps, you can talk to NPC Shiro, also located near the Free Market entrance, to exchange the stamps for a permanent equip item of your choice. Dinosaur Snapback, Vintage Hoodie Jacket, Slime Slippers, Green Hat Chat Ring, Green Hat Label Ring, Gas Mask and Helmet, Green Bunny T-Shirt (M), Green Electric Guitar, Dinofrog Shoes, Green Crown (M), Green-Rimmed Glasses, Green Tie Casual Suit, Green Leaf Shoes, Slime Stick, Dinofrog Hat, Dinofrog Outfit, Dinofrog Gloves, Musical Green Onion, Bold Slime Hat, Green Kitty Shirt, Good Night Monster Chat Ring, Mini-Mini Slime, Green Leaf Hat, Green Tie & Shirt, Green Rain Cap, Green Raincoat, Olive Beanie, Green Shutter Shades, Military Cargo Jacket (M), Slime Earrings, Blooming Leafy Love Outfit (F), Leafy Dream Wings, Green Ting Slippers, Superstar Headphones, Slither Style Hoodie, Yellow-Green Backpack, Leaf, Green Shades, Green Overall Shorts, and Green Blazing Sword. Remember that the St. Patrick's Day Surprise Style Box is useful for 90 days. There're even some St. Patrick's Day Green items are on sale in shop, such as, Green Eye Color, Friendship Ring: Clover, Clover Shield, Green Visor, Green Goya Hat (M), Green Disco Shirt (M) and Green Disco Pants (M). Various of special packs and pets are available in shop now. More details focus on the official release or www.maplestoryer.com where sells cheap Maplestory 2 mesos and accounts.